LucixLogix reveals XLR8, a new software application to optimize power and performance of embedded GPUs. LucidLogix (Lucid) today announced GPU virtualization software designed to improve the response performance, visual quality and battery efficiency of mobile devices including smartphones, tablets, ultrabooks, notebooks and more. Codenamed “XLR8”, Lucid has taken the core technology behind its recently announced Virtu MVP software and applied it to single, embedded graphics processors like AMD Fusion™, ARM® Mali, Intel® Ivy Bridge™ and NVIDIA® Tegra™. XLR8 increases CPU frame generation while minimizing redundant GPU rendering tasks, providing maximum input responsiveness, sometimes as high as a 200 percent improvement. And, it does this while minimizing battery drain. XLR8 allows mainstream and mid-range GPUs to deliver the experience of higher priced systems with discrete GPUs. 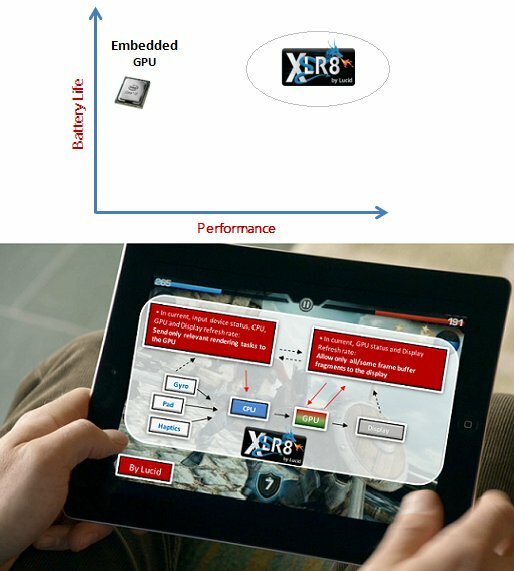 The core technology behind XLR8 uses unique multi-threading, task detection and redundant task removal processes that are also sensitive to battery/power draw.